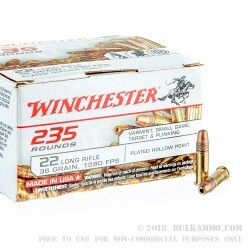 Winchester Ammo has been in business for many many years under the Olin Corporation, and re-built its ammunition manufacturing business around defensive and sports ammo in 1980. Since then, Winchester, under the Olin Corp licensing has brought out a massive variety of ammo types, available calibers, specialized designs, and more. Winchester even helped during the first Gulf War by manufacturing big amounts of ammo for the troops in the Gulf. The 22 Long Rifle cartridge has been around since 1887 and was designed by the J. Stevens and Arms company as a way to bridge the gap between 22 Long and the 22 Extra Long rounds. 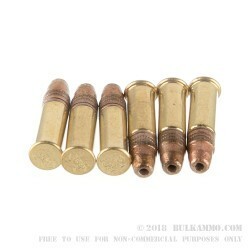 Winchester 22 LR 36 grain Copper Plated Hollow Point rounds have brass cases that are rimfire primed and reloadable with the proper specialized rimfire reloading equipment. They have a muzzle velocity of 1280 feet per second. 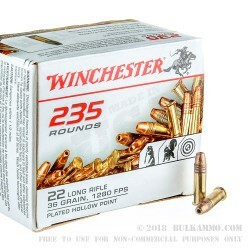 These Winchester packs of 235 rounds provide you with a moderate amount ammo for various purposes, while still being easily affordable. The suggested uses are Target shooting, plinking, small game and varmint hunting. 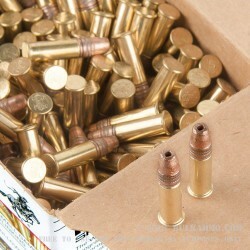 Shore up your 22 LR ammo supply and grab 4 or 5 boxes today. Winchester/Olin Corporation rounds are proudly made in the USA.